The decision comes one day before a ‘rebuilding community police trust’ town hall featuring Mayor Schaaf, Police Chief Kirkpatrick and the Stanford team. 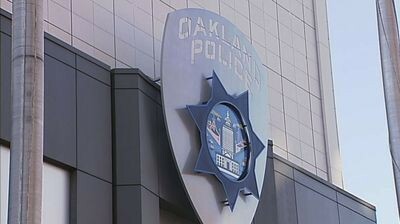 The Oakland City Council's Public Safety Committee rejected a quarter-million-dollar contract extension with Stanford University researchers to assist the police department's implementation of a system designed to track and reduce racial profiling by officers. Critics of the Stanford contract, including several longtime police accountability activists, said they feel the money would be wasted and that the police need to take responsibility and make the changes — not the university researchers. Stop data is used by OPD to quantify the rates at which different racial groups are stopped, searched, handcuffed, and arrested. Prior analysis of the data by the Stanford researchers revealed that OPD officers are more likely to stop and search Black people than other racial groups, even when they don't appear to have a reason. Black people are also more likely to be handcuffed without reason, and officers have been shown to use less respectful language when addressing Black people. Stanford's team concluded, however, that there is "little evidence that disparate treatment arose from explicit racism or purposeful discrimination." Rather, they attribute the disparity to unconscious forms of "implicit bias." The Stanford team made 50 recommendations to OPD as part of a larger project to help the department improve its relationship with the community. At last night's committee meeting, OPD requested that the council continue to employ Stanford Professor Jennifer Eberhardt's team to finalize 2 of 50 recommendations. But police accountability activists and two members of the public safety committee expressed skepticism that a quarter-million-dollar contract is required to implement the two recommendations. They said Stanford's advice is helpful, but they placed responsibility on OPD. "With all due respect to the work Dr. Eberhardt has done, we are not entirely comfortable with this proposal," said Rashidah Grinage, an activist with the Coalition for Police Accountability. "The implementation has to be done by OPD," said Grinage. "The implementation cannot be done by a consultant. There seems to be no end to this." Others criticized the approach taken by OPD and the Stanford team to characterize the more harmful impact policing has on Black people. "I got off the Eberhardt train when she came up with this 'implicit bias' as being the reason for why officers may be engaging in racial profiling or excessive force," said Assata Olugbala, an Oakland resident who attends most council committee meetings. "That says you don’t know what you’re doing because you unconsciously do it. The other side is you’re very, very conscious of what you’re doing." Councilmember Desley Brooks, chair of the public safety committee, also criticized spending money on the Stanford team's work and the concept of implicit bias. "I don’t believe we call things as they are," said Brooks. "There’s a lot of talk about implicit bias because I know that’s the buzzword everybody uses, but out in the community, when people are being affected, they call it racial profiling." Brooks also said she's frustrated that the city continues to pay millions on court oversight of the police department and that the department's stop data still shows wide disparities. But Assistant Police Chief Leronne Armstrong defended the contract as a necessary tool for the department. "I think what’s important to understand is that when you practice intelligence-based policing, precision-based policing, you have to focus in on those [people] that are committing crimes. We have to use intelligence that’s driven by a community's communication, what they’re telling us, who’s calling the police and what are they reporting? Who is the identified suspects in the crimes that we’re following up on? I feel like the disparity obviously exists based on who commits crimes in this city. If we’re focused in our enforcement efforts, we expect our officers to focus in on those individuals engaged in crime, and use intelligence. And so what we’ve done with Dr. Eberhardt’s assistance is really better understand how to review the data that we're taking in so we can examine what our officers are engaged in." Brooks pushed back on Armstrong's statement, saying, "There are many studies that talk about if you over-police a particular community, you will get more people from that community who are arrested as opposed to people who aren’t in that community. So it doesn’t bear out that people of color are committing all the crimes and that’s why we have the disparities." Brooks also asked if the contract with Stanford is a requirement under Oakland's Negotiated Settlement Agreement, an oversight effort to reduce racial profiling that was enforced by U.S. District Judge William Orrick. A public safety town hall featuring Mayor Libby Schaaf and Stanford Professor Jennifer Eberhardt is scheduled for tomorrow. "This is not a court mandate," Armstrong said of the contract with Eberhardt. But he added that the court is requiring implementation of the 50 recommendations Eberhardt made in the "Strategies for Change" report on OPD's racial disparities. Following a brief debate, the committee failed to approve the contract. Councilmembers Larry Reid and Abel Guillen voted in favor, but Brooks abstained and Noel Gallo voted no. Toward the end of the committee hearing, Brooks, Reid, and others discussed the possibility of bringing the proposed contract back for reconsideration. But the immediate rejection of the contract comes at an awkward moment. Tomorrow night, Eberhardt is scheduled to speak alongside Oakland Mayor Libby Schaaf, Police Chief Anne Kirkpatrick, Assistant Chief Armstrong, and others at a public safety town hall at Laney College. 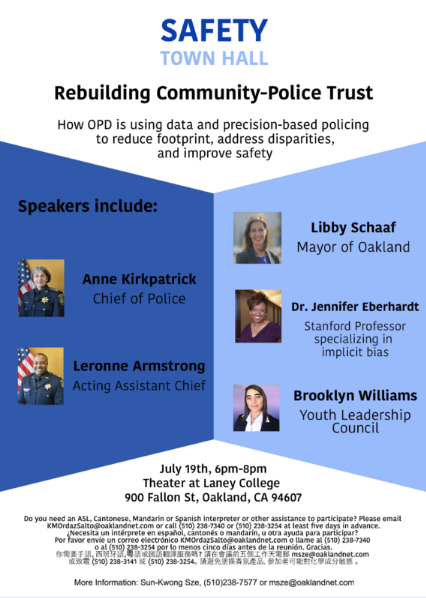 They will discuss Eberhardt's work and the use of stop data by OPD as part of the community relations campaign. "I am stunned a councilmember could vote against a study of such importance or abstain from a vote of such magnitude," Schaaf said in a statement this afternoon. Schaaf said she'll work to reinstate Eberhardt's work.